In this tutorial, we’ll provide more options for a user to work with the data in the “Price” column. We’re about to learn how to customize the grid with custom filters, cell renderers and cell editors. And we’ll have it all implemented and integrated in less than 10 minutes. The two methods that most components need to implement are init and getGui. The former is used to receive parameters from ag-Grid, and the latter is called by ag-Grid to get the view to renderer. The job of the grid is to lay out the cells. 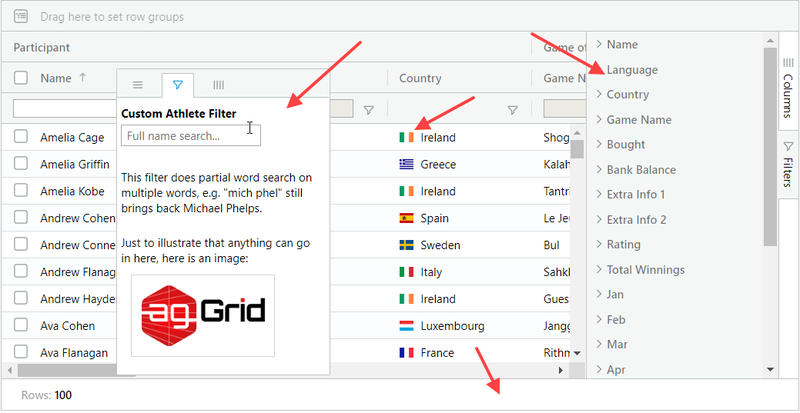 By default the grid will create the cell values using simple text. If you want more complex HTML inside the cells you need to implement cell renderers. We want to format our number according to a user’s locale so we need a custom component. The component will take advantage of the built-in function toLocaleString to format values. It’s a simple component with just two methods init and getGui that returns a span element containing formatted text. Notice that we also receive the valueGetter function through parameters from ag-Grid. We then use it to retrieve the current value of a cell. In this article, I explain how to do some convention based dynamic formatting. Wow, that sounds awesome, but what do I mean by all these fancy words?